As part of a month of action, the GMP reinforced its fight against domestic abuse by raising awareness of underreported crime, capturing criminals wanted for domestic abuse offences and encouraging people to recognise the signs in their own or someone else’s relationship. Operation Scratch, which ran Running from Monday 12th September to Sunday 9th October, saw officers from across Greater Manchester working together to search for people who have committed domestic abuse related crimes and reaching out to communities, urging them to report suspicions or get support if they are a victim. Detective Chief Superintendent Paul Rumney said: “This month shows our continued commitment to tackling domestic abuse and supporting victims through these horrendous crimes. “We work hard all year round to fight this blight on society but months like this really help us re-focus on what is important and work together to bring offenders to justice. It was also really important that we shared key information with our officers and staff to ensure they are in the best possible position when supporting victims. We have arrested around double the amount of offenders this month than we do in an average month, sending a clear message – domestic abuse will absolutely not be tolerated here in Greater Manchester and we will do everything that we can to ensure victims are kept safe. The operation came eight months after a change in the law which made coercive and controlling behaviour in relationships illegal. Since then, GMP has investigated 55 reports under the new legislation. The new legislation means that victims who are subjected to coercive and controlling behaviour can bring their perpetrators to justice, with incidents that stop short of serious physical violence but amount to extreme psychological and emotional abuse will now be recognised as a crime within the domestic abuse framework. Officers targeted offenders who had committed crimes against their loved ones, while maintaining the campaign started by GMP when the legislation first changed: SCRATCH. 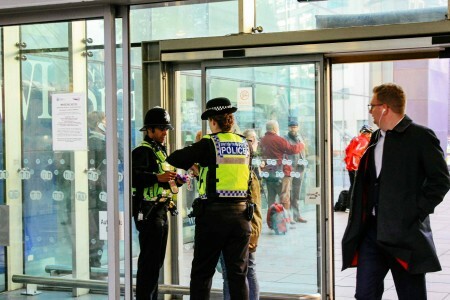 Raising awareness of the signs to look for when it comes to coercive and controlling behaviour the campaign saw officers give members of the public SCRATCH cards which, instead of revealing a cash prize, uncovered another layer of controlling behaviour as the sections are scratched away. As well as raising awareness with the public specially trained officers spent the month sharing their knowledge with officers and staff from across the Force, holding training sessions for front line officers who deal with domestic abuse incidents first hand. For more information, whether you are a victim, friend, family member or neighbour please visit: www.gmp.police.uk/domesticabuse. You can read more about the new law and the types of behaviour associated with coercion and control in this document: Statutory guidance framework: controlling or coercive behaviour in an intimate or family relationship.